What a complicated title that is if you see it without reading the post, huh? This is my post for Rhonda and Quilter in the Gap's Finish-a-Long - pre-quarter 2 goal list, let's call it. Maybe that's better. Goals. Easy peasy. This is what I'm hoping to get done! 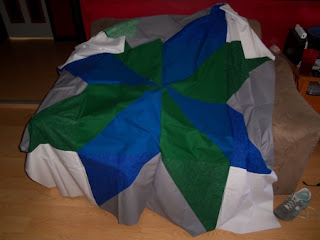 Project 1: K's quilt: Yes, the same project that was first on the list LAST quarter... but I've at least made SOME progress - all I have to do is bind it. I think I've been putting it off for so long because part of me knows it's not very good at all - it was the first quilt I put together, so the back is horribly bunched, it's not pieced very well... but I think she'll still like it, all the same. Project 2: One of the "crosshatch" quilts: It's currently in three strips, awaiting more of the white to sash the rows together and the solid raspberry color that I can't remember the proper name of in order to add borders. 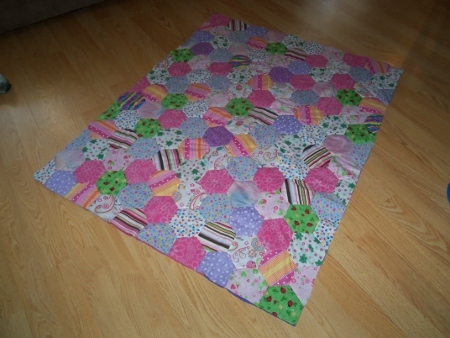 I think this might be for my good friend T's little girl, who's adorable and who I know will enjoy it, if she doesn't drown in it, as she's three and this quilt seems ginormous. Project 3: Giant star quilt number two: As I posted about previously, I finished Sara's Wedding Quilt but managed to have almost an entire quilt top left over, so I'm hoping to finish it for another friend of mine. I think I'll do similar quilting on it after I add yellow borders at the top and bottom. Note to self, buy a yard of yellow fabric. My shoe got in the photo? Weird. Project 4: 16 patch quilt: Made from squares from a not-so-great swap that I joined (it was my first, and I've quickly come to agree that swaps involving Joann-quality fabric aren't the greatest, even though I freely use their fabrics through my own projects). I think I might finish this up for my parents. 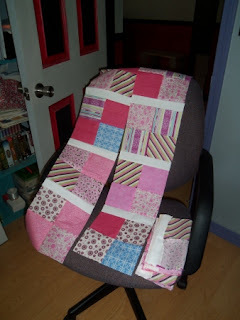 I've got all the blocks put together, and the fabric that I've chosen for sashing has arrived. Hopefully I've got enough. I'm not entirely sure, because I'm lazy. 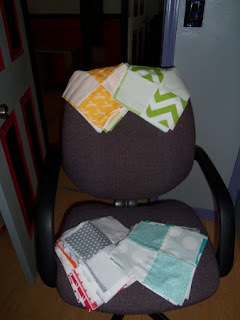 Project five: Baby quilts: As I mentioned above, I freely use Joann-quality fabrics, because it's cheap and nearby and there's something satisfying about having things in hand immediately instead of ordering them. Most of these fabrics are from their red tag racks. 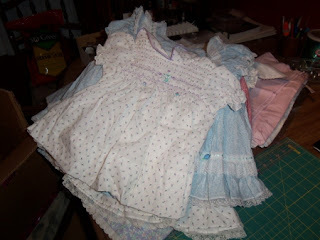 I just grouped it all together, cut it up into squares...and lo and behold, I had enough for THREE baby quilts out of it. Since this photo I've got them all made into quilt tops. My goal's to finish one this quarter. 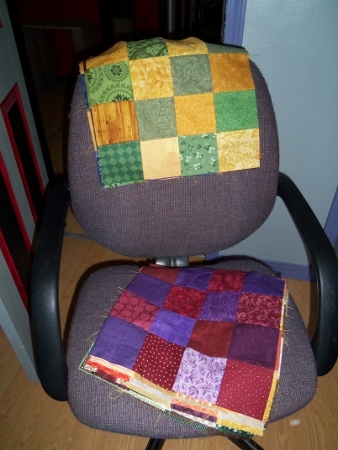 Three quilts stacked up here, but my goal's just to finish one. Set my sights nice and low, I will. Project six: Half Moon Modern quilt: I've got four-patch blocks made out of my two Half Moon Modern charm packs, and I'm hoping to finish it up. I want to sash it with something but I'm not entirely sure which color to use. Any suggestions??? 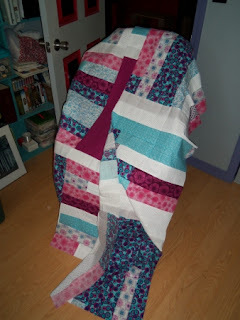 Project 7: This is the big 'u - clothes quilt: My friend Rebecca, who I've only met online but have known that way for years (the internet is pretty awesome, huh?) has commissioned me to make a quilt from her daughter's baby clothes. I've watched Autumn grow up, thanks to the joys of Livejournal and Facebook, so I was definitely interested in taking on the project! 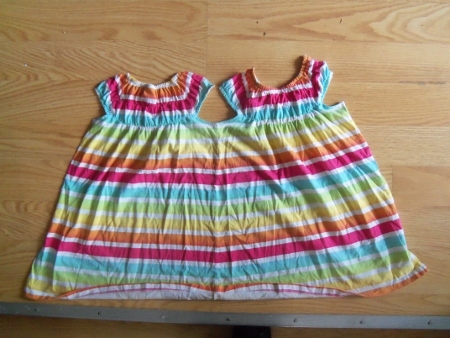 Even more fun is that some of the clothes were Rebecca's when SHE was little, so it's a multi-generational thing. 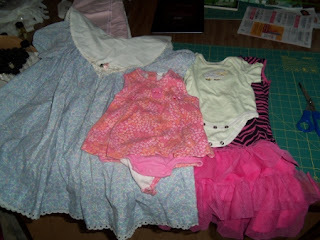 So far I've got all the clothes cut into "cloth," so to speak. I was surprised at how much fabric comes out of a single shirt or dress! 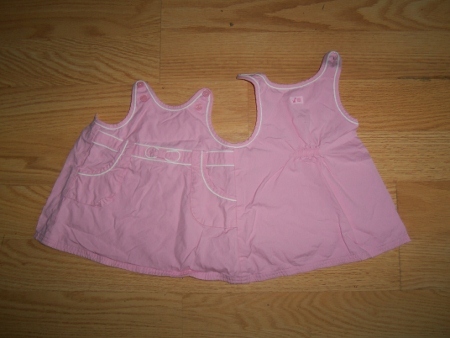 I plan on using applique for details like the little pockets and belt on this dress, and the other cute embroidery and such on other items. (Another epic comment? Yes). I was SO nervous to cut into these cute dresses! They weren't handmade, but looked like they could have been. Alrighty, there we go! Seven projects for three months. Totally can handle this. Or at least half of this. 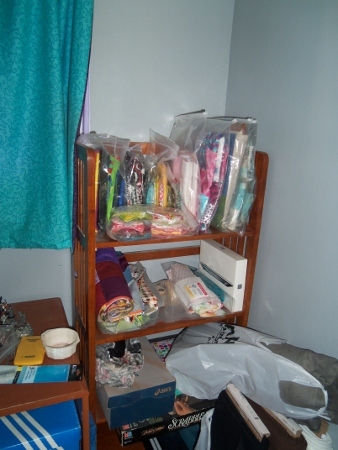 Until all the swap fabrics come in and I get distracted, anyway!